There is an old proverb that warns us against the temptation to “run before you learn to walk”. This occurs in all aspects of our lives, and I guess that is what makes us human. As a senior trainer at Autodesk, I am always guiding people back to the basics. I’ve seen this temptation to leap right into the deep end with new software from people involved in all aspects of post production. And regardless of which software people are trying, they inevitably skip the basics and want to do the mind-blowing stuff right away. Smoke is certainly not the exception to this rule. In fact, the power of Smoke and the depth of its creative toolset can make it seem even more daunting than your typical application that does only one or two things. dcpPlayer is a software based DCP (Digital Cinema Package) player for the Windows operating system. dcpPlayer is designed to allow viewing of a non-encrypted DCP's without the need of a cinema with hardware based DCP player and projector. Is The Traditional Post House Dead? In parts 1-3 of the PsF’s missing workflow series, we introduced the terms benign PsF & malignant PsF, and revealed the PsF status of several professional AVCHD cameras from 3 manufacturers (Canon, Panasonic, and Sony). In part 4, we did the same with several file-based HD video recorders from 6 different manufacturers. In part 5, we revealed how one recorder manufacturer is offering its own “Band-Aid” software to counteract the inappropriate signals offered over HDMI by many camera manufacturers. In part 6, I published and Open Letter to all pro AVCHD manufacturers. Here in part 7, I’ll cover how to deal with 25PsF and 29.97PsF on a progressive sequence in Premiere Pro CS5.5.x. RenderMon (currently in beta) is an innovative new web-based application that enables digital media artists to remotely monitor and manage the video rendering process, as well as securely upload, view and share the rendered video from Vimeo. At IBC2011 I spoke with AVID, Promise Technology, and AJA to see how editors are pairing Smoke with the latest gear to build diverse workflows for color correction, on-set effects or editorial, and stereoscopic 3D finishing. This article is an exploration of 3D techniques and ideas. I have spent two years gathering blogs, videos, looking for articles on a new visual language for film editors and meeting with 3D post specialists. There are several things that need to be addressed prior to the reader proceeding. First, this is not a technical guide to editing 3D, however, when my journey began it quickly became obvious that knowledge of the technical aspects of 3D is necessary to execute new ideas and that a lack of knowledge in this area would lead to a subpar article on the ideas of 3D editing. AMA-linking does not seem to cause any gamma shifts. So Fast Import and AMA seem to be the reliable ways to bring in QT files with correct levels. Part 1 - The Good The Sony PVM OLED Series. We had been searching for monitors to replace the JVC 24” DT-V24 Monitors that we were currently working with as they were becoming insufficient for SD work (especially scrolling legals/text) and we didn’t want to look for 2nd hand CRT replacements. We had been trialling other brand’s LCD/LED broadcast panels, but non justified the cost over our current JVC’s. So I got my Sony PDW-F3 including the paid S-Log/4:4:4 upgrade since August. Since then I was searching for the perfect solution to record the 4:4:4 output of the camera. A few months back the only reasonable solution was the Cinedeck Extreme recorder at about $12.000. I am not quite sure but I can remember having read somewhere that the only way to capture 4:4:4 on the cinedeck is Cineform 8-bit, which is quite a limitation too. RED Scarlet X in action - first video footage, RED's new camera in action! Tonaci Tran, who works as a camera operator, RED camera supervisor and RED digital imaging technician, published a series of footage taken with the brand new RED Scarlet X! Since its release, the RED Epic has been pumping out tons of test footage, chart samples and eye candy on Vimeo. It has also been busy shooting well-known features like the Spiderman reboot and Ridley Scott’s Prometheus. It's edging close to the two-year mark since DSLRs were first used on professional motion-picture and TV productions. Back then, it was an open question whether DSLRs could find a home in mainstream production or whether using them constituted a one-off production trial. Equally important was whether the postproduction zeitgeist could easily adapt to some of the weaknesses inherent in the cameras themselves: issues of compression, rolling shutter and moiré/anti-aliasing, etc. We have been working on these updates for several months and had originally hoped to release the new version on the 29th November. However, we are not yet fully satisfied with the stability of this version with its many new features and therefore we have made the difficult decision to delay its release to our customers. Sure, the black is indeed really, really black. No backlight polluting the panel. But what about the monitor as a whole in regards of colors, build quality and options? With Creative Cloud, Adobe is switching from a model of software as a product to Software as a Service (SaS). By early 2012, Adobe Creative Cloud is expected to include such applications as After Effects, Premiere and Photoshop. Creative Cloud includes a hub for viewing, sharing and syncing of files, and a subscription with 20GB of cloud storage. The Digital Production Partnership (DPP) will release a metadata application next year to help production companies comply with proposed file-based delivery requirements. ORLANDO, FLA.—Ever since the launch of RED Digital Cinema, 4K imagery has become an industry buzzword. The concept stems from 35mm film post, where the digital scan of a film frame at 4K is considered full resolution and a 2K scan to be half resolution. In the proper used of the term, 4K only refers to frame dimensions, although it is frequently and incorrectly used as an expression of visual resolution or perceived sharpness. Apple’s iconic tower system, the Mac Pro, is the slowest selling Mac. With the advent of ultrafast thunderbolt I/O on everything from the MacBook Air to quad core iMacs, do users need the Mac Pro anymore? Usually, when we start talking terahertz, it means one thing: lasers! But not today, friends. Today, we're talking something with a little less flash and a little more potential for everyday use. ROHM, a Japanese electronics component manufacturer, has developed a chip measuring just 1.5mm by 3mm that can transmit data at up to 1.5Gbps using those precious terahertz radio waves. That's both significantly smaller and faster than existing terahertz wireless experiments and the research teams at ROHM and Osaka University (who are collaborating on the project) believe they can scale the tech up to 30Gbps -- enough bandwidth to stream HD video to every room in your home, provided you don't live in a 200 room mansion. Perhaps most exciting though, producing these chips costs only a few hundred Yen, while earlier versions saw prices hovering at around several thousand. For a few more technical details check out he machine translated PR at the source. Whether your are a Final Cut Pro user, Avid Media Composer user, or Premiere user, we'd like to introduce you to Adobe On Location. In our opinion, this is an incredible application that is sometimes overlooked in the professional video industry. It ships with the Adobe Creative Suite Production Premium. Trust us on this one, this software is really a nice addition to any video production professional. choice, and waiting a few months may be priceless. In this color correction / color grading tutorial I cover a foundational topic, the Order of Operation workflow. It describes the order of corrections that will give organization speed and efficiency to our color grading. Adobe is always impressing us, and this time is no exception. This tech demo at MAX 2011 shows many new “sneak peaks” but one of the most impressive ones comes in at 25 minutes. Taking a locked off video clip, the demonstrator shows how he uses software to change the 3D position and depth of field along with moving the subject around in the image. Just watch and be amazed! Now this is how a dropping jaw sound like! Like Perian on the Mac, the Combined Community Codec Pack is a simple playback pack for Windows with the goal of supporting the majority of video formats in use today. Adobe After Effects is my go-to tool for most homebrew VFX and finishing tasks. It has the perfect blend of powerful features and editorial, layer-based ease of use. Is it as fast as a dedicated color grading system, or as responsive and powerful as Nuke for VFX compositing? No, but it offers a flexible, creative environment that’s tough to beat for the kind of creative, rough-and-tumble cinematic problem-solving that comprises most of my work. Avid Media Composer 6 began shipping last week after being announced just under a month ago. The release has seen quite a bit of press as it was teased back in the summer and a large part of that tease was letting users know what they could expect when this version came along. I haven’t had a chance to really pound MC6 as of yet since it just shipped but I have been kicking the tires on it for the last few days. Keep an eye on That Post Show for upcoming episodes all about MC6. In September, James Cameron and Vince Pace’s Cameron | Pace Group and Grass Valley entered into a strategic alliance aimed at expanding the use of 3D in the broadcast industry through technology development. The ALEXA camera is capable of acquiring metadata during recording a take. This metadata is stored within an atom in the header of the recorded QuickTime file or the file header of an ARRIRAW file. As with Software Update Packet (SUP) 4.0 and 5.0 the amount of metadata captured grows further. 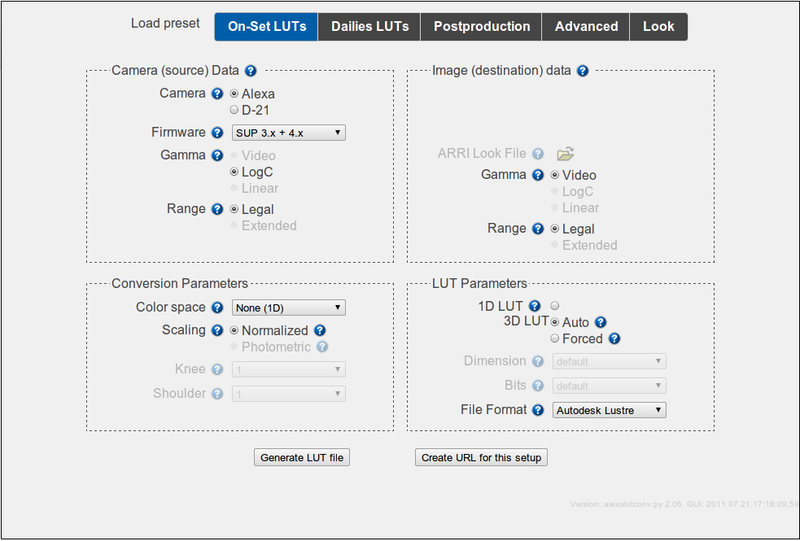 When using an ALEXA Plus or the ALEXA Studio camera Lens data and VFX relevant data can be captured. To make use of this metadata, it has to be extracted from the QuickTime file. It starts in Japan. The Fukushima area was devastated by the tsunami. Along with thousands of dead and injured, the tsunami caused heavy damages on the Sony manufacturing plant causing a shortage of professional recording media, mostly HDCAM and HDCAM SR tapes. The shortage of physical media helped realizing the importance, and now necessity, of file based workflow. It's said that nothing boosted the on going tapeless trend as much as the Japanese tsunami did. So the tapeless era kicked in. Everyone who wasn't there yet got forced in and the hard drives were spinning like there's no tomorrow. Until, another natural disaster struck. Just as we got used to save out masters and FTP our programs instead of writing the to tape. Just as we ordered a few extra terrebytes to our SANs and got used to the ease and simplicity of fast, random access, cheap drives, disaster struck the second time. This time flooding Thailand and washing those hard drive manufacturers with it. Hard drive prices are rocketing and upgrading the old SAN is now much more expensive, if at all possible. As far as the video/film production industry concerns, this couldn't have happen in a worst timing. Or has it. Maybe this natural disaster can be turned, just like the first one, to our advantage. Maybe this event can drive a new paradigm once again. The industry evolved from tapes to drives. Maybe the time is ripe for another revolution - from drives to the cloud. There are already quite a few cloud based e d i t o r s. At worst they're gimmick, at best they're a proof of concept. But they're definitely going that direction. Adobe has already started offering their software as a service. For now it's mostly for still images, but it won't be long until they, and others will offer professional video oriented products. It's called taking lemons and make lemonade. Or maybe take the flood and make it into a cloud. Whatever you call it, the future is there. And if you claim, correctly, that cloud based editing is also dependent on drives. Well it is, but Google, Amazon and Apple probably have a few spindles at hand. At least until the next disaster strikes. נראה שכל הכרטיסים של AJA כרגע עובדים עם MC6 על פיסי ומק, חוץ מioXT. בלינק המצורף נמצאים כל הדרייברים להורדה. כדי לכבוש את עולם הקולנוע, ולהשוות פיצ'רים של פרמייר ואפילו פיינל קאט היישן, אביד יצטרכו להעלות את הרזולוציה ולאפשר לעבוד ולסיים - לעשות מאסטרינג, לפחות ב2K וב4:4:4. As reported in some forums, if you’re trying to use DNxHD Quicktimes in Adobe Premiere Pro CS 5.5.2 and you have an AJA Kona card installed, you might run into an issue where the playback stutters badly. There’s an easy fix for this. This is all on the 2.4Ghz 8-core Mac Pro, running OS 10.6.8, connected to our Small Tree Ethernet SAN and this is with DNxHD 145, 72op / 59.94 video. You can now set the destination path for transferred media according to the metadata you enter into the main window. For instance, you could setup the destination path to be Day > Camera > Reel and then enter the relevant metadata values before transferring. The interface for customizing metadata is very similar to Post Haste. Several more tasks have been added to Batch Renamer including Insert Characters at Position and Replace Characters in Range. You can now also optionally Find and Replace file extensions too. QT Edit can now perform operations on batches of files. Go to File > New Batch and select all of the files you wish to process. Select the tasks you wish to perform (you can perform more than one at a time) and when you're done, click Process. A new window will appear asking you how you want to save the files. If you select Update existing files, the existing files on disk will be overwritten. This is a very quick process to perform. The other options create duplicates of the files, either in the same directory or in a new one. Not every function is supported in batch mode and we're keen to hear requests for additional functions users would like to see in the batch window. You can still collapse the old way if you prefer. Third-party transparent clips can be added to a blacklist in preferences so that they will not be collapsed. We also fixed the Video Check known issue from the previous beta where progress would happen in big lumps on Lion instead of being smooth, giving the impression that the application had hung if it was a large file. Lion is now our recommended operating system for Video Check and it is the only platform we are offering 10-bit processing support for. This is a beta release designed for evaluation purposes. It is not intended for use in a production environment. If you require stability please use version 1.0.5 instead. You can download the 1.1 beta here. The final release of 1.1 will be a free update for all existing customers. One of the smartest video guys I know (who also has impeccable taste in food) is Gary Adcock. Check out this two part video on working with file-based video workflows. Gary has served as a tech consultant on several books as well as technical projects… the man is a genius. AJA Intensive: File Based Workflows with Gary Adcock (Pt 1 of 2) from Createasphere on Vimeo. AJA Intensive: File Based Workflows with Gary Adcock (Pt 2 of 2) from Createasphere on Vimeo. Blackmagic Design today announced HyperDeck Software Update 2.0, a new software update for its popular HyperDeck Studio that adds broadcast quality compressed 10 bit recording and playback to the Avid® DNxHD® format. DNxHD is a broadcast industry standard for media files and adding native support for this compressed video format into HyperDeck Studio will allow dramatically longer recoding times, lower media storage costs, and full file format compatibility with Avid Media Composer® systems. All media is recorded in MXF format, so it’s immediately available in Media Composer without any time consuming file copying or import processing. Free basic Redcine-X Pro video tutorial - learn how to use the grading application! Redcine-X is a grading tool by RED - the software is still in development and you can find the recent versions here. Here's a video tutorial on setting up your Redcine-X Pro (beta 5) to Process Red One, Epic, or Scarlet Footage. Vidchecker is an automated QC software from the Bristol based company VidCheck that rivals the likes of Baton and Cerify. Not only is it a rock solid QC solution it is a very very very competitively priced bit of kit that doesn’t skimp on features. I got a bit of a surprise when I downloaded Blackmagic’s recent DaVinci Lite update. The free version of the color-grading tool had been limited to only two nodes for color correction. In the 8.1.1 update that limit has been removed. DaVinci Lite now includes unlimited color-correction nodes. You heard that right: unlimited nodes in the free version of DaVinci Resolve. And apparently Avid DNxHD codecs are also now included free. Blackmagic Design Announces DaVinci Resolve Lite now Includes Unlimited Color Correction Nodes! InterBEE 2011, Tokyo, Japan - November 16, 2011 - Blackmagic Design today announced DaVinci Resolve Lite 8.1, a new version of the free DaVinci Resolve that now includes unlimited color correction nodes. Unlimited color correction nodes allow customers to use multiple color correctors for more complex and creative grading and is a dramatic boost in power over the previous version of DaVinci Resolve Lite that was limited to 2 nodes. Adding more than 2 color correction nodes was the top requested feature by DaVinci Resolve Lite colorists. DaVinci Resolve will be demonstrated on the Blackmagic Design InterBEE booth. To help promote the art of color correction, DaVinci Resolve Lite includes many powerful features found in the full version of DaVinci Resolve for an extremely powerful toolset that anyone can download free of charge. DaVinci Resolve Lite includes all the same high quality processing of the full DaVinci Resolve, however limits projects to SD and HD resolutions, unlimited nodes using a single processing GPU and a single RED Rocket card. Stereoscopic 3D features, noise reduction, power mastering, remote grading and sharing projects with an external database server are features only offered in the full DaVinci Resolve so are not included in this free DaVinci Resolve Lite edition. Customers who want these features can simply upgrade to the full DaVinci Resolve Software for only US$995. Even with the restrictions of the free DaVinci Resolve Lite, image quality is never limited, and customers can use the incredible image processing quality of DaVinci Resolve. In addition DaVinci Resolve Lite can still accept high resolution source footage in 2K, 4K and 5K from the latest digital cameras from RED and ARRI, so customers get a fantastic digital camera utility. DaVinci Resolve Lite still includes high quality optical resizing, curve grading, XML import and export, 32 bit float processing, YRGB image processing, multi layer timelines, stabilization, window tracking, primary and secondary color correction, real time processing, capture and playback with deck control, compatibility with third party control panels and much more. With so many powerful features at absolutely no charge, customers will be able to experience the dramatic improvement to their work from using professional color correction. DaVinci Resolve Lite is available now and free of charge from the Blackmagic Design web site. Product photos of the DaVinci Resolve Lite, and all other Blackmagic Design products, are available at www.blackmagic-design.com/press/images. About Blackmagic DesignBlackmagic Design creates the world’s highest quality video editing products, color correctors, video converters, video monitoring, routers, live production switchers, disk recorders, waveform monitors and film restoration software for the feature film, post-production and television broadcast industries. Blackmagic Design’s DeckLink capture cards launched a revolution in quality and affordability, while the company’s DaVinci Emmy™ award winning color correction products have dominated the television and film industry since 1984. Blackmagic Design continues ground breaking innovations including stereoscopic 3D and 4K workflows. Founded by world leading post production editors and engineers, Blackmagic Design has offices in the USA, UK, Japan, Singapore, and Australia. For more information, please check www.blackmagic-design.com. Last week we released Post Haste 2.0.2 which adds several new features to our project organization tool. You can now import the structure of an existing project folder. Just click the + button in the Template Editor, select Import Folder Structure and choose a folder to import. Post Haste will import the folder and all subfolders into the project but will not import any files. This is a very quick way of setting up a new template. Parameters can now be locked to prevent user modification. The parameter will appear grey in the list and cannot be edited in the Project pane. Use the Default Value field in preferences to set a value before locking. Post Haste is an essential tool to help creative professionals organize their projects. To find out more, download the software free of charge and check out the video overview and user manual. Nvidia's Maximus technology boosts workstation performance: SANTA CLARA, CA — Today, Nvidia introduced its new Maximus (www.nvidia.com/maximus) technology, which accelerates work by enabling a single workstation to simultaneously handle interactive graphics and the compute-intensive number crunching associated with the simulation or rendering of the results. Previously, this was accomplished in separate steps or on separate systems. Dave with Realm Pictures talks us through the basics of color grading and why it is so important, especially with underwater footage. He then goes into a quick tutorial demonstrating some of the principles of coloring using After Effects. What is the difference between Free run, record run and time-of-day timecode? There are actually only 2 different types of timecode but one has two names. Free-run timecode or time-of day timecode is timecode that starts at a preset programmed time (08;00;00;00 for example) and runs continuously – even when the camera isn’t filming. Therefore, if a camera starts filming at 08;00;00;00 and takes a 10 minute break at 08;00;30;00, the timecode of the next clip would be 08;00;40;00. In parts 1-3 of the PsF’s missing workflow series, we introduced the terms benign PsF & malignant PsF, and revealed the PsF status of several professional AVCHD cameras from 3 manufacturers (Canon, Panasonic, and Sony). In part 4, we did the same with several file-based HD video recorders from 6 different manufacturers. In part 5, we revealed how one recorder manufacturer is offering its own “Band-Aid” software to counteract the inappropriate signals offered over HDMI by many camera manufacturers. Starting with part 7, I’ll begin offering workarounds within several software editing programs, and with at least one external application. However, here in part 6, I am asking questions and making suggestions to the 3 professional AVCHD camera manufacturers who are responsible for creating this entire mess in the first place. אם צילמתם באלקסה ולא בLogC אז ממש חבל. למעשה זרקתם ים של אינפורמציה שאנשי הפוסט היו צריכים/רוצים ופספסתם את כל הפוטנציאל של המצלמה המעולה הזו. בין אם צילמתם בRAW או בProRes (או DNxHD בפירמוור האחרון) ניתן לבחור במצלמה עקומת גמא בשם LogC. לא ניכנס בפוסט הזה להגדרה המדוייקת של מה זה LogC, בגדול נגיד שזו צורה של קידוד שהופכת את הקובץ לעשיר יותר לעיבוד ע"י המחשב. המדריך הבא יעבור על השלבים של איך להוציא את המקסימום מהמצלמה שלכם (בטח של חברת השכרת הציוד אבל נגיד...) ואיך לנצל את האינפורמציה הזו בשלבי הפוסט. הרוב מתחיל ונגמר בכלי שחברת Arri נתנה למשתמשים שלה. חברת RED למשל לא נותנת כזה כלי, מה שהופך את העבודה אם המצלמה הזו לתהליך של ניסוי וטעייה או לחלופין, למי שלא בא להסתבך, לוויתור על הקידוד הלוגריתמי היעיל. הכלי נקרא Arri LUT Generator (על מה זה LUT ניתן לקרוא בפוסט הזה). ייצור LUT לשימוש בסט: אם נעשה שימוש במוניטור מכוייל בסט, ניתן לדמות עליו איך ייראו החומרים בחדר העריכה (או בבית או בקולנוע) כבר בסט הצילומים. LUT זה נועד כדי לעזור לכוון תאורה והגדרות שונות במצלמה כמו צמצם, עדשה, פילטרים ועוד. ייצור LUT לדייליז: דייליז, בין השאר, הוא שם לתהליך של המרת חומרים מצולמים לצורך עבודה במערכת עריכה. בעזרת שימוש ב LUT, ניתן להמיר את צבעוניות חומרי הגלם (בעזרת כלי נוסף) כך שיראו "נכון" כבר בשלב עריכת ה Off Line. ייצור LUT לשלב הפוסט פרודקשן: עבודה על חומרים לוגריתמים בשלב תיקוני הצבע מתעלה בהרבה על עבודה בחומרים במרחב גמא של וידאו. ייצור LUT קריאייטיבי: ניתן בעזרת הכלי ליצור טיוטה או מניפולציית צבע ראשונית שאותה ניתן להעביר למערכות פוסט שונות להמשך עבודה. עכשיו נעבור שלב שלב בחלונות הכלי כדי ללמוד על מה כל חלק אחראי. חלון ה Camera Source. בחלון זה מכניסים את ההגדרות שהשתמשנו במצלמה. סוג המצלמה, גרסאת קושחה (Firmware), עקומת הגמא וטווח הצבעים. אידיאלית, ההגדרות יהיו כמו בחלון למעלה. החלון השני Conversion Parameter: פה נבחר לאיזה פלטת צבעים אנחנו רוצים להמיר את החומרים. אם החומרים הולכים לטלוויזיה, נבחר REC709 בתפריט Color space. בחלון הבא נגדיר את עקומת הגמא. אנחנו רוצים אותה בוידאו. יש יתרונות לעבודה ב Linear, אבל עבודה זו דורשת ניהול צבע מורכב יותר והיא בעיקר יעילה בסביבת אפקטים. בשביל תיקוני צבע לטלוויזיה נשמור את הגמא בטווח וידאו. בחלון האחרון נבחר את המערכת אליה אנחנו רוצים לייצא את הLUT. מגוון המערכות כולל מערכות תיקוני צבע ייעודיות כמו Scratch, Lustre, Baselight ו DaVinci. יש אפשרות לייצא LUT גם למערכת After Effects הפופולרית במחוזותינו. הסברים כלליים אלו נועדו כדי לתת כלים לשליטה בפלטת הצבעים ובקידוד הגמא של מצלמת אלקסה. בגלל ריבוי תהליכי העבודה ותוכנות העריכה, האפקטים ותיקוני הצבעים השונות, אני לא אכנס להגדרות פרטניות לכל תוכנה. בקרוב אכתוב פוסט על עבודה עם חומרי מצלמה לוגריתמים בתוכנת אפטר אפקטס. עד אז אני ממליץ לחפש בגוגל כל הגדרה שאתם לא מכירים ולצלול לתוך ים המידע שתמצאו. לחילופין תמשיכו לעקוב אחרי הבלוג הזה ולפוסטים שמתפרסמים בו על הליכי עבודה וכלים מתקדמים בפוסט פרודקשן. למי שלא מכיר/זוכר. ClipWrap עושה בדיוק כפי שמעיד שמו - הוא עוטף קליפים בפורמט mts/m2t ושאר תצורות mpeg למפורמטים ידידותיים לעריכה. הקודק נשאר אותו קודק (mpeg2) רק המעטפת משתנה ולכן אין איבוד דור והתהליך קורה במהירות. מומלץ לכל משתמשי Sony/Panasonic. Imagine what you could be doing instead of having to spend time copying and converting media to edit it. That’s the beauty of AMA, a powerful timesaving feature only available from Avid.